Simply Music DJ Service has been in Business since 2006. We are located in Aurora Illinois and Service the Northern Illinois area. We are dedicated to Personal Service that other DJ's do not offer while providing the Professional Quality that you deserve. Owner, Rich Johnson, has been in music for most of his life playing in bands at a young age and keeping music in the family since. Rich spent 17 years as a Police Officer in Will County Sheriff and Aurora Police Department until retirement in 2005. Keeping music in mind, interest in the DJ Industry was at a peak. Sound Reinforcement and Recording is also part of the business as well. 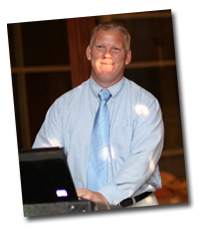 Rich strives to make your choice as your DJ and easy but Professional and Fun Experience. Do Not Let the Price Fool You!! Most DJ's charge an average of $1200.00 for Wedding Reception Service and $500.00 for Parties but here at Simply Music DJ Service Your price is Affordable without giving up the Personal & Professional Service You Deserve ! You can pay $1200.00 and get less service, have it "Their Way" with less equipment unless you pay more. You will see in services and photos that we provide complete, All-Inclusive Packages that are filled with Lighting and Sound equipment like no other. Our complete 6hr Package with full Sound & Dance Lighting is $895.00 and comparable to Services well over $1500.00 that my competitors offer. I committed when I started this to offer the most Professional Service with Class and include whatever equipment it takes to make your Sound, Lighting and Music over the top for you on your Special Day at a price you can afford. We have fun and keep the floor filled with your guests without the obnoxious DJ on the microphone all evening playing "His/Her Music". We cater to your wishes from you being in as much control as you wish. We honor your Do Not Play List as well! This is YOUR DAY so you will have it YOUR WAY. We are here for you and that is my #1 Priority! Organization and Preparation is a Must at Simply Music DJ Service. We have a comprehensive Online Planning page that is completely Your Page. You can login anytime, anywhere from your computer or Mobile Device. There you can plan your event and enter as much information as you wish. These are saved and you can access and print it any time. It is a fun and easy way to make sure your day goes without a hitch. We are always here to help you through the process if needed. Simply Music DJ Service is Completely Insured ! If you or your venue requires Insurance, contact me and a Certificate of Insurance will be provided. I hope you feel comfortable in your choice in DJ selection so please Call 630.364.0313, Email us at info@simplymusicdj.com or Contact Rich Johnson at Simply Music DJ Service. Thank You & Have A Great Day !! We at Simply Music DJ Service have a Job to do. When you hire a DJ, you should not have to decide on how much equipment to hire. I feel it is the DJ's job to do that. We will make sure that when you hire us, we will decide if you need additional; Speakers, Dance Lighting, Microphones, etc.. to make your event Top Quality! If a job is undersized for sound and lighting, it makes the DJ look bad. You should not be blamed for not purchasing enough equipment. That is why our packages are All Inclusive. The only add-ons are accessory lighting (Mood & Up-Lighting) and additional time. My goal at Simply Music is to earn the privilege of having you as a customer. I believe this will only be achieved if I give you the service you expect. If your goal is to have a well-organized, entertaining and worry-free event, make Simply Music your choice.